NK cells play essential roles in eliminating virally infected cells and tumor cells. Polyinosinic-polycytidylic acid (poly I:C), a double-stranded RNA analog recognized by melanoma-differentiation associated gene 5 (MDA5) and TLR3, activates NK cells in vivo. MDA5 and TLR3 signal through distinct adaptor molecules, IFN-promoter stimulator-1 (IPS-1) and Toll/IL-1R domain-containing adaptor inducing IFN-β (TRIF), respectively. However, it remains unclear how NK cells are activated by poly I:C in vivo. In this study, we demonstrate that the IPS-1-dependent and the TRIF-dependent pathways are essential for NK cell activation to poly I:C stimulation in mice, whereas deficiency in either IPS-1 or TRIF only modestly impairs the poly I:C-induced NK cell activation. Furthermore, both IPS-1 and TRIF contributed to suppression of implanted B16 tumor growth in response to poly I:C administration via NK cell activation. Presence of IPS-1 and TRIF in dendritic cells (DCs), but not NK cells, was required for production of IFN-γ to poly I:C in NK cells in vitro. 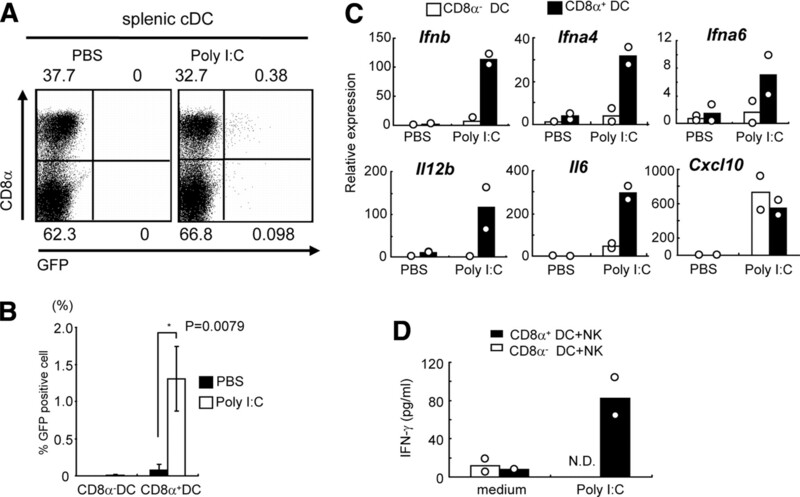 Moreover CD8α+ conventional dendritic cells (cDCs), but not CD8α− cDCs, expressed genes for type I IFNs, IL-6, and IL-12p40 in response to poly I:C stimulation, and were also responsible for inducing IFN-γ production in NK cells. Taken together, poly I:C activates the IPS-1- and TRIF-dependent pathways in CD8α+ cDCs, which in turn leads to NK cell activation. Natural killer cells are innate lymphocytes that are important for sensing invading pathogens and tumors (1, 2) Activated NK cells mediate cytotoxicity by releasing perforin and granzymes (3), and produce cytokines such as IFN-γ and TNF. Activation of NK cells is induced by direct recognition of cells infected with viruses via NK receptors as well as by type I IFNs and cytokines produced by innate immune cells such as dendritic cells (DCs)3 (4, 5, 6, 7). Further, IFN-γ produced by NK cells is important for subsequent acquired immunity including T cell activation (8, 9). Upon RNA virus infection, innate immune cells, such as DCs and macrophages, recognize viral dsRNA via retinoic acid-inducible gene-I (RIG-I)-like receptors (RLRs) and TLR3 (10, 11, 12, 13). RLRs, RIG-I, and melanoma differentiation-associated gene 5 (MDA5), are characterized by two N-terminal caspase-recruit domains (CARDs), a DExD/H-box RNA helicase domain and a C-terminal regulatory domain (14). RIG-I and MDA5 differentially recognize RNA viruses and RNAs in the cytoplasm. Whereas RIG-I senses various RNA viruses belonging to paramyxoviruses, orthomyxoviruses, flaviviruses, and Rhabdoviruses, MDA5 detects picronaviruses and calicivirus (11, 15). RLRs interact with viral RNA species. RIG-I senses single-stranded RNA with 5′-triphosphate end and short dsRNA (16, 17), though MDA5 recognize long dsRNA (18). Both RIG-I and MDA5 trigger signaling pathways via IFN-β promoter stimulator-1 (IPS-1), also known as MAVS/Cardif/VISA (19, 20, 21, 22). IPS-1 harbors a N-terminal CARD, and localizes on mitochondrial membrane. Mice lacking IPS-1 failed to produce type I IFNs to RNA viruses recognized by both RIG-I and MDA5. IPS-1 activates two IκB kinase (IKK)-related kinases, IKK-i, and TANK-binding kinase 1 (TBK1) via TNF receptor associated factor (TRAF) 3. IKK-i and TBK1 phosphorylate IFN-regulatory factor (IRF)-3 and IRF-7, which initiate the transcription of type I IFNs. In contrast, TLR3 recognizes dsRNA in endosomes (10), and initiates signal transduction via Toll/IL-1R domain-containing adaptor inducing IFN-β (TRIF) (23). TRIF recruits TRAF3, TRAF6, and receptor interacting protein kinase 1, and activates the transcription factors IRF-3/-7 via IKK-i and TBK1. The TLR3-TRIF pathway also activates NF-κB leading to production of proinflammatory cytokines (24). Polyinosinic-polycytidylic acid (poly I:C) is a dsRNA analog, and treatment of animals with poly I:C induces strong antiviral and antineoplastic effects accompanied by activation of CD8+ T and NK cells (10, 25). In addition, poly I:C is shown to serve as an adjuvant to induce protective CD4+ T cell responses against HIV gag p24 (26). We previously showed that MDA5 or IPS-1, but not TRIF, is critical for poly I:C-induced production of type I IFNs, whereas induction of IL-12p40 in serum is dependent on the presence of TLR3-TRIF, but not MDA5-IPS-1 (11, 27). Enhancement of Ag-specific Ab production by poly I:C is majorly dependent on the presence of IPS-1, and mice lacking both IPS-1 and TRIF show complete loss of Ab production (27). Nevertheless, it has not been clarified how TLR3 and RLRs contribute to the activation of NK cells in response to poly I:C stimulation. Although CD11cdullB220+ plasmacytoid DCs (pDCs) are well known type I IFN-producing cells to virus infection, it was shown that type I IFNs are not produced by pDCs to poly I:C stimulation in mice (28). In contrast, CD11c+B220− conventional DCs produced type I IFNs to poly I:C. However, conventional DCs are subclassifed into CD8α+ and CD8α− DCs, and the DC cell type that initially recognizes and responds to poly I:C has not been identified. In the present study, we elucidate the contributions of the IPS-1- and TRIF-dependent signaling pathways to the activation of NK cells in response to poly I:C stimulation in vivo. 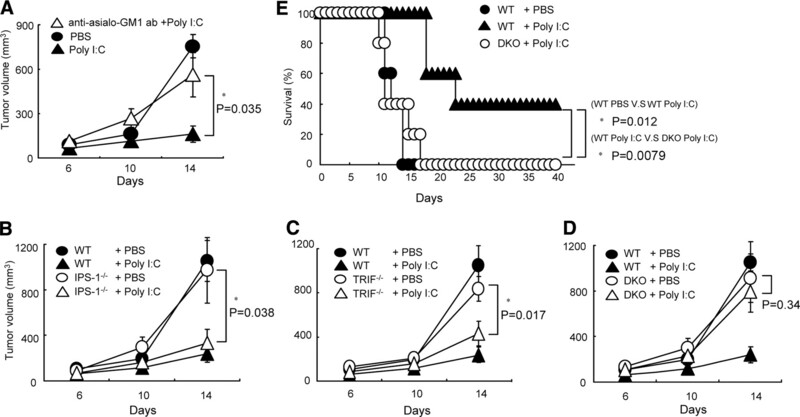 The IPS-1- and TRIF-dependent pathways were essential for NK cell activation to poly I:C inoculation in mice, whereas deficiency in either IPS-1 or TRIF only modestly impairs the poly I:C-induced NK cell activation. Furthermore, mice lacking both IPS-1 and TRIF failed to suppress implanted B16 tumor growth in response to poly I:C administration, though deficiency in either IPS-1 or TRIF inhibited B16 growth to poly I:C. CD8α+ conventional dendritic cells (cDCs), but not CD8α− cDCs, expressed genes for type I IFNs, IL-6, and IL-12p40 in response to poly I:C, and were also responsible for inducing IFN-γ production in NK cells. These results indicate that poly I:C activates the IPS-1- and TRIF-dependent pathways in CD8α+ cDCs, which in turn leads to NK cell activation. TRIF−/−, IPS-1−/−, and Ifna6gfp mice were described previously (23, 28, 29). Mice were used at 8–16 wk of age. Mouse experiments were conducted in accordance with institutional guidelines of animal care and use committees. B16-F1 cells were purchased from American Type Culture Collection (CRL-6323) and cultured in DMEM supplemented with 10% heat-inactivated FCS, penicillin G (100 μl/ml), streptomycin (100 μg/ml) at 37°C, 5% CO2. YAC-1 cells were provided by Dr. Tsutui (Hyogo College of Medicine, Hyogo, Japan) and cultured in RPMI 1640 medium supplemented with 10% heat-inactivated FCS, 100 μM 2-ME, penicillin G (100 μl/ml), streptomycin (100 μg/ml) at 37°C, 5% CO2. Poly I:C was purchased from GE Healthcare. CpG-DNA (ODN1668) was described previously (29). An ELISA kit for IFN-γ was purchased from R&D Systems. The NK cell cytotoxicity assay was performed by a standard 51Cr release assay. In brief, single-cell suspensions prepared from spleen were depleted of erythrocytes by RBC lysing buffer (Sigma-Aldrich). Splenic NK cells were enriched via MACS separation by negative selection (Miltenyi Biotec). The purity of the NK cells was 60–80% as determined by FACS analysis. Target cells (YAC-1 cells) were incubated with 51Cr for 1 h at 37°C. After washing the target cell three times, 51Cr-labeled YAC-1 cells (1 × 104 cells/well) were cultured with indicated numbers of NK cells at 37°C in round-bottom 96-well plates in the total volume of 200 μl. After a 4-h incubation, 150 μl of the supernatant were harvested and the 51Cr radioactivity of supernatant was measured. The percentage of specific cell lysis was calculated using the following formula: % cytotoxicity = 100 × (sample release – spontaneous release)/(100% killed release – spontaneous release). IFN-γ and granzyme B production by NK cells was determined by intracellular cytokine staining. Splenocytes (1 × 106 cells) were incubated on 96-well round plates with target cells (splenocytes: target cells = 2:1) for 4–6 h in the presence of 10 μg/ml brefeldin A (Sigma-Aldrich). After cell surface staining with mAbs specific for DX5-FITC and CD3-allophycocyanin, cells were fixed, permeabilized with the Cytofix/Cytoperm reagent (BD Biosciences) followed by intracellular IFN-γ-PE or granzyme B-PE. Results represent percent of gated DX5+CD3−cells producing IFN-γ or granzyme B. For CD69 up-regulation, NK cells enriched by MACS separation were stained with DX5-FITC, CD3-allophycocyanin, and CD69-PE Ab. NK cells were gated DX-5+, CD3 −. Data were acquired with a FACSCalibur or FACSCanto II (BD Biosciences) and analyzed using the software Flow Jo 8.6 (Tree Star). B16-F1 cells (1 × 106 cells) were prepared in PBS and s.c. inoculated into the shaved right flank of mice. The tumor sizes were evaluated by direct measurement of the tumor dimensions using a metric caliper. Poly I:C (250 μg/head) or PBS was injected i.p. twice per week. For NK cell depletion, anti-asialo GM1 Ab (Wako Biochemicals) was repeatedly injected i.p. twice per week. B16-F1 cells were implanted on the day of initial NK cell depletion, and treatment with poly I:C was started 2 days after B16-F1 cell implantation. The tumor volume was calculated according to the formula V = L × W2 × 0.52, where V is the volume, L is the length, and W is the width. NK cells were purified from spleens by repeated positive selection of DX5 positive cells with DX5 Micro Beads (Miltenyi Biotec). CD11c+ DCs were purified from spleen by repeated MACS separation with CD11c+ Micro Beads (Miltenyi Biotec) (5). NK cells and CD11c+ DCs were cocultured with poly I:C(50 μg/ml) or CpG-DNA (1 μM) or medium. After 24 h, IFN-γ concentrations in the supernatants were measured by ELISA. For purification of DCs by FACS, spleens were treated with 400 Mandl U/ml collagenase D (Roche) and 10 μg/ml DNase I (Roche) in RPMI 1640 supplemented with 10% FCS at 37°C for 30 min. EDTA was added (10 mM final concentration), and the cell suspension was incubated for an additional 5 min at 37°C. Cells were spun through a 15.5% Accudenz (Accurate Chemical & Scientific) solution to enrich for DCs (30). DCs were stained with CD8α-FITC, CD11c-APC, CDB220-PerCP, and PDCA-1-PE (Miltenyi Biotec). CD11c+CD8α+ cells, CD11c+CD8α− cells and plasmacytoid cells (CD11cdullB220+PDCA-1+ cells) were sorted by FACSAria (BD Biosciences). For purification of NK cells by FACS, splenocytes were depleted of B and T cells by incubation of anti-thy1.2 MACS beads (Miltenyi Biotec) and anti-CD19 MACS beads (Miltenyi Biotec) by using MACS separation. The remained cells were stained with DX-5-FITC and CD3e-allophycocyanin, and DX-5+CD3e−cells were sorted by FACSAria. The purity of the sorted DCs and NK cells were routinely >95%. Total RNA was extracted using TRIzol according to the manufacturer’s instructions (Invitrogen). cDNA was generated by using ReverTraAce (Toyobo), and PCR was conducted on cDNA samples with following primers: TLR3 (forward: 5′-GAGAGAGATTCTGGATGCTTGTGTTTG-3′, reverse: 5′-GTCTCATAATGGTTTATCATCTACAAAG-3′); MDA5 (forward: 5′-CTTCCTGGATGTTCTGCGCCAA-3′, reverse: 5′-CCGTGGGGAGGCAGATAATAAT-3′); β-actin (forward: 5′-CTATGTGGGTGACGAGGCCCAGAG-3′, reverse: 5′-GGGTACATGGTGGTACCACCAGAC-3′). qPCR analysis was performed using the 7700 Sequence Detector (Applied Biosystems). Primers for 18s rRNA were used as an internal control. Probes were purchased from Applied Biosystems. The statistical significance (p < 0.05) of differences between groups was determined by Student’s t test, Kaplan-Meier test. To elucidate the mechanism of NK cell activation in response to poly I:C in vivo, wild-type, IPS-1−/−, TRIF−/−, and IPS-1−/−TRIF−/− mice were treated with poly I:C for 18 h, and the cytotoxic activities of their splenic NK cells against YAC-1 target cells were determined. The cytotoxicity of NK cells in response to poly I:C stimulation was highly enhanced in wild-type and IPS-1−/− mice, and the activity was only modestly decreased in TRIF−/− mice (Fig. 1⇓, A and B). In contrast, deficiency in both IPS-1 and TRIF resulted in abrogation of poly I:C-induced NK cell cytotoxicity (Fig. 1⇓C). These results indicate that both IPS-1 and TRIF contribute to the activation of NK cell cytotoxicity to poly I:C inoculation, whereas IPS-1 and TRIF plays a redundant role in the activation of NK cell cytotoxicity to poly I:C.
IPS-1- and TRIF-dependent activation of NK cell cytotoxicity in response to poly I:C stimulation in vivo. Poly I:C was i.v. injected into wild-type (WT), IPS-1−/− (A), TRIF−/− (B), and IPS-1−/−TRIF−/− (DKO) (C) mice, and their spleens were harvested. NK cell cytotoxicities against YAC-1 cells were measured by a 51Cr release assay at different E:T ratios. The percentages of specific cell lysis are indicated. Data represent the mean ± SD of triplicate or quadruplicate measurements. The data shown are representative of at least three independent experiments. Elimination of target cells by NK cells is mediated by granzymes, a family of structurally related serine proteases, and perforin, the membrane-disrupting protein. Thus, we examined expression of granzyme B in NK cells treated with poly I:C in vivo. Splenocytes from mice treated with poly I:C or PBS for 18 h were incubated with YAC-1 target cells for 6 h, and granzyme B accumulation of their NK cells were measured by flow cytometry analysis. 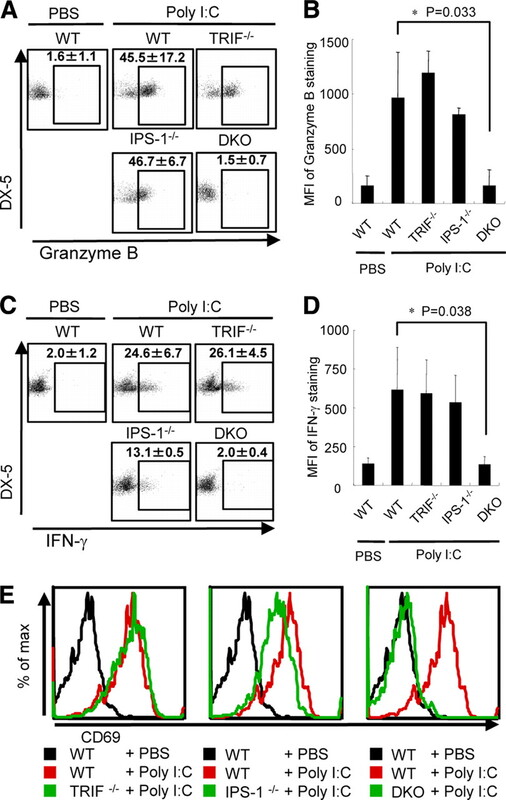 Although granzyme B accumulation in NK cells in response to poly I:C was not impaired in mice lacking either IPS-1 or TRIF, granzyme B was not induced in IPS-1−/−TRIF−/− NK cells (Fig. 2⇓, A and B). This result indicates that granzyme B accumulation of NK cells were also dependent on IPS-1-and TRIF-pathways as NK cytotoxicity. Next, we investigated IFN-γ expression in NK cells restimulated by target cells. IFN-γ-producing NK cells were comparably generated in wild-type and TRIF−/− mice, and partially decreased in IPS-1−/− mice (Fig. 2⇓, C and D). Nevertheless, poly I:C stimulation failed to up-regulate IFN-γ-producing NK cells in IPS-1−/−TRIF−/− mice. Subsequently, we examined the surface expression of CD69 as the activation marker of NK cells. Splenic NK cells from mice treated with poly I:C or PBS for 18 h were analyzed by flow cytometry. CD69 was comparably up-regulated in wild-type and TRIF−/− NK cells in response to poly I:C, and partially decreased in IPS-1−/− mice (Fig. 2⇓E). Again, poly I:C failed to up-regulate CD69 on NK cells in IPS-1−/−TRIF−/− mice. The DX5+CD3− NK cell population was not altered in wild-type and IPS-1−/−TRIF−/− splenocytes (data not shown), suggesting that the abrogated NK cell activation in IPS-1−/−TRIF−/− mice in response to poly I:C is not due to a developmental defect of NK cells. Expression of granzyme B and IFN-γ in NK cells and CD69 expression of NK cell. Poly I:C (250 μg/head) or PBS was i.v. injected to IPS-1−/− mice, TRIF−/− mice, IPS-1−/−TRIF−/− mice, and the littermates for 18 h. Splenocytes were incubated with YAC-1 cells for 6 h. NK cell responses were evaluated by flow cytometry. The intracellular expressions of granzyme B (A) and IFN-γ (C) within splenic NK cells were examined by immunostaining. Data represent the mean ± SD of triplicate mouse data. B and D, Mean fluorescence intensities (MFIs) of granzyme B (B) and IFN-γ (D) staining are represented. Data represent the mean ± SD of triplicate measurements (E) Expression of CD69 on the surface of NK cells. The data shown are representative of at least two independent experiments. Collectively, IPS-1 and TRIF are essential for the activation of NK cells in response to poly I:C stimulation in vivo, and these proteins compensate each other for activating NK cells, whereas either the IPS-1- or the TRIF-dependent signaling is capable of activating NK cells. NK cells are one of the cellular effectors that eliminate tumor cells (31, 32). B16-F1 melanoma cells, which display low levels of MHC class I molecules, are known to be targeted by NK cells (25, 31, 33). When NK cells were depleted from mice by anti-asialo GM1 Ab, poly I:C indeed failed to suppress growth of B16-F1 cells in mice (Fig. 3⇓A). This result indicates that NK cells play a pivotal role in elimination of B16-F1 tumor cells in response to poly I:C stimulation. To investigate the roles of IPS-1 and TRIF in the elimination of tumors mediated by poly I:C administration, we s.c. inoculated 1 × 106 cells of B16-F1 into the right flank of mice. The tumors grew in wild-type, IPS-1−/−, TRIF−/−, and IPS-1−/−TRIF−/− mice with similar time courses for 14 days after implantation (Fig. 3⇓, B–D). The tumor growth was dramatically suppressed by poly I:C administration compared with control PBS administration in wild-type mice. 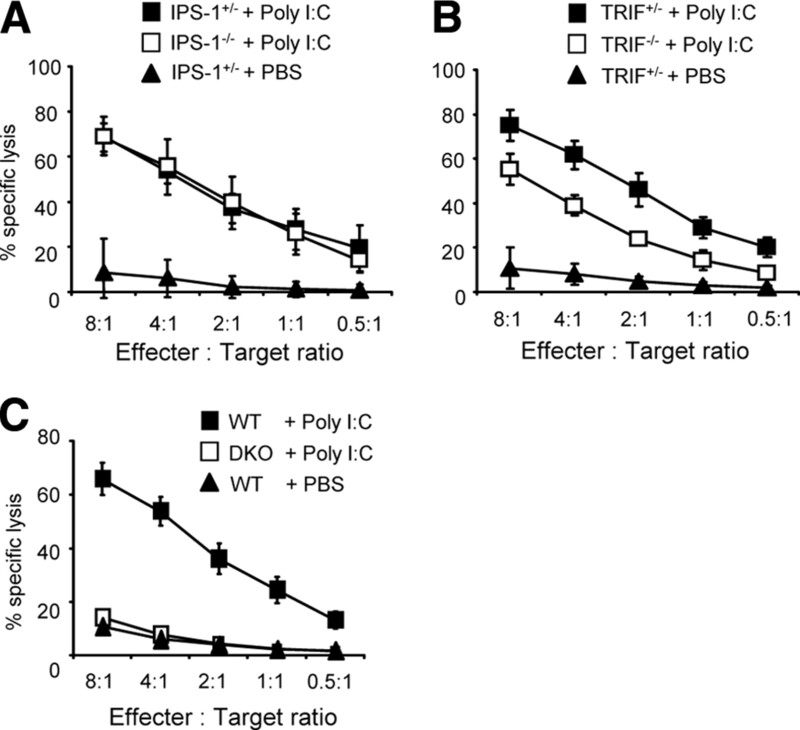 Although deficiency in either IPS-1 or TRIF merely perturbed the suppressive effect of poly I:C on tumor growth, poly I:C failed to inhibit B16-F1 tumor progression in IPS-1−/−TRIF−/− mice (Fig. 3⇓, B–D). To confirm the antitumor effect of poly I:C in vivo, B16-F1 cells were injected i.p. and the number of survivors were monitored. Mice injected with poly I:C survived significantly longer than those injected with PBS. Consistently, the mortality of B16-implanted IPS-1−/−TRIF−/− mice was not improved in response to poly I:C, though poly I:C treatment significantly prolonged survival of wild-type mice with tumor burden (Fig. 3⇓E). These results indicate that the IPS-1- and TRIF-dependent signaling pathways are essential for poly I:C to exert its antineoplastic effect in response to experimentally implanted mouse tumor cells. The effect of poly I:C on B16 tumor growth suppression is dependent on both IPS-1 and TRIF. A–D, B16-F1 cells (1 × 106) were implanted s.c. and poly I:C (250 μg/head) or PBS were injected i.p. twice per week. Time courses of tumor growth in the indicated mice were represented. A, C57BL/6 mice were i.p. treated with anti-asialo GM1 Ab twice per week for depleting NK cells, and the effect of poly I:C treatment on B16-F1 cells was examined. B–D, The effect of poly I:C was examined in wild-type (WT), IPS-1−/− (B), TRIF−/− (C) and IPS-1−/−TRIF−/− (DKO) (D) mice. Each value represents the mean tumor volume ± SEM for 5–7 mice per groups. (∗, p < 0.05 at 14 days after tumor implantation). E, Wild-type (WT) or IPS-1−/−TRIF−/− (DKO) mice were i.p. inoculated with B16-F1 cells (1 × 107). Survival rate of mice treated with poly I:C were represented. Each symbol represents one mouse. Statistical analysis was performed by Kaplan-Meier test. Several reports have shown that human NK cells express TLR3 and can directly recognize dsRNA for their activation (34, 35). Therefore, we examined whether murine NK cells can be directly activated by poly I:C in vitro. We purified NK cells and CD11c+ DCs by MACS separation, and cocultured in the presence of poly I:C. Stimulation of purified splenic NK cells alone with poly I:C failed to induce IFN-γ production (Fig. 4⇓A). In contrast, incubation of NK cells with splenic DCs together with poly I:C activated IFN-γ production (Fig. 4⇓A). Interestingly, NK cells from IPS-1−/−TRIF−/− mice produced IFN-γ normally, when they were cocultured with DCs from wild-type mice (Fig. 4⇓A). These results indicate that presence of IPS-1 and TRIF in NK cells is dispensable for IFN-γ production in response to poly I:C in the DC-NK cell coculture system. Expression of IPS-1 and TRIF in DCs, but not NK cells, is required for IFN-γ production to poly I:C in vitro. A, Splenic NK cells purified from wild-type (WT) and IPS-1−/−TRIF−/− (DKO) mice and syngeneic CD11c+ DCs from wild-type mouse spleen were cocultured at a DC/NK cell ratio of 1:2 in the presence of poly I:C (50 μg/ml) or CpG-DNA (1 μM) for 24 h. IFN-γ concentrations in the supernatants were measured by ELISA. N.D. indicates a concentration that is lower than the detection limit. Data represent the mean ± SD of duplicate measurements. The data shown are representative of at least two independent experiments. B, Splenic CD11c+ DCs from wild-type (WT), IPS-1−/−, TRIF−/−, and IPS-1−/−TRIF−/− (DKO) mice and syngeneic NK cells were cocultured at a DC/NK cell ratio of 1:10 with poly I:C (50 μg/ml) for 24 h. IFN-γ concentrations in the supernatants were measured by ELISA. Data represent the mean and range of two values. The data shown are representative of at least two independent experiments. Then, we conducted reciprocal experiments for assessing the role of IPS-1 and TRIF in DCs. Splenic CD11c+ DCs purified from IPS-1−/−, TRIF−/−, and IPS-1−/−TRIF−/− mice were cocultured with wild-type NK cells in vitro in the presence or absence of poly I:C. Whereas TRIF−/− DCs were less potent to induce IFN-γ production in wild-type NK cells than wild-type DCs, IPS-1−/− DCs normally induced NK cell IFN-γ production (Fig. 4⇑B). Furthermore, DCs from IPS-1−/−TRIF−/− mice failed to induce NK cell IFN-γ production even in the presence of poly I:C (Fig. 4⇑B). These results indicate that recognition of poly I:C in DCs is important for the NK cell activation, and IPS-1 and TRIF are required in DCs, but not in NK cells for inducing IFN-γ production. Taken together, these results suggest that recognition of poly I:C by DCs is important for NK cell activation for inducing IFN-γ production. Treatment of mice with poly I:C induces the production of type I IFNs and IL-12p40 in sera in the IPS-1- and the TRIF-dependent manners, respectively (27). However, it remains unclear which cell types contribute to the production of these cytokines. We previously generated mice expressing GFP under the control of the IFNα6 promoter (Ifna6gfp), and showed that poly I:C activated cDCs, but not pDCs, in the spleen, whereas R-848, a TLR7 ligand, induced IFNα production in pDCs (28). cDCs are subclassified to CD11c+CD8α+ DCs and CD11c+CD8α− DCs (36). When Ifna6gfp mice were treated with poly I:C for 5 h, significantly increase in GFP+ cells was observed in CD8α+ DCs compared with CD8α− DCs in the spleen. (Fig. 5⇓, A and B). The result suggested that CD8α+, but not CD8α−, cDCs are IFNα producers in the spleen in response to poly I:C.
CD8α+ DCs, but not CD8α− DCs, express type I IFNs and IL-12p40 in response to poly I:C stimulation. A, Ifnα6gfp mice were treated with 200 μg of poly I:C for 5 h, and the expression of GFP in splenic CD11c+B220− cDCs was analyzed by flow cytometry. B, Ratio of GFP+ cells in CD8α+ or CD8α− cDCs after poly I:C inoculation in Ifna6gfp mice is shown. Data represent the mean ± SD of three replicate individual mice. C, CD8α+ and CD8α− CD11c+B220− cDCs were sorted from WT mouse splenocytes treated with poly I:C (250 μg) for 4 h by flow cytometry. The expression levels of genes encoding IFNα4, IFNα6, IFNβ, IL-12p40, IL-6, and CXCL10 were determined by qPCR. D, NK cells were cocultured with CD8α+ or CD8α− cDCs in the presence of poly I:C (50 μg/ml) for 24 h. The concentrations of IFN-γ in the culture supernatants were measured by ELISA. The data shown are representative of at least two independent experiments. N.D. indicates a concentration that is lower than the detection limit. To investigate cytokine gene expression in splenic DCs to poly I:C, we sorted CD8α+ and CD8α− splenic cDCs from poly I:C-injected mice, and examined the expression of the genes encoding IFNα4, IFNα6, IFNβ, IL-12p40, IL-6, and CXCL10. Interestingly, expression of the genes encoding both type I IFNs, IL-12p40 and IL-6 was highly up-regulated in CD8α+ DCs, but not in CD8α− DCs (Fig. 5⇑C). In contrast, the Cxcl10 gene was similarly up-regulated in CD8α+ and CD8α− DCs, probably owing to secondary activation of type I IFN signaling in CD8α− DCs. Then, we examined the ability of CD8α+ and CD8α− cDCs to support NK cell IFN-γ production to poly I:C in vitro. We sorted CD8α+ and CD8α− cDCs from untreated splenocytes by flow cytometry, and cocultured them with NK cells in the presence of poly I:C. As shown in Fig. 5⇑D, IFN-γ was produced when NK cells were cultured with CD8α+ DCs, but not with CD8α− DCs, in the presence of poly I:C.
Taken together, the results demonstrate that CD8α+ DCs, but not CD8α− DCs, recognize poly I:C via both the IPS-1- and TRIF-dependent pathways to produce various cytokines including type I IFNs and IL-12p40. Furthermore, CD8α+ DCs, but not CD8α− cDCs, are responsible for the activation of NK cells in response to poly I:C.
Finally, we investigated the expression of TLR3 and MDA5 in NK cells, CD8α+ and CD8α− cDCs and pDCs. Semiquantative RT-PCR analysis revealed that TLR3 was more abundantly expressed in CD8α+ cDCs compared with other cell types (Fig. 6⇓), consistent with elevated expression of IL-12p40 genes to poly I:C observed in CD8α+ cDCs. In contrast, MDA5 was ubiquitously expressed in all cell types tested (Fig. 6⇓). Although poly I:C-elicited type I IFN production was dependent on the presence of the MDA5-IPS-1-dependent pathway, we show that CD8α+ DCs alone produced type I IFNs to poly I:C. Given that MDA5 is a cytoplasmic protein, it is possible that poly I:C is not accessible to MDA5 in various cell types except CD8α+ cDCs. Gene expression of poly I:C receptors in innate immune cells. Splenic NK cells, CD8α+, CD8α− cDCs, and CD11cdullB220+PDCA-1+ pDCs from C57BL/6 mice were sorted by flow cytometry. Total RNA were prepared for measurement of TLR3, MDA5, and β-actin mRNA expression by semiquantitative RT-PCR. The data shown are representative of two independent experiments. In the present study, we demonstrate that both the IPS-1- and TRIF-dependent pathways contribute to activation of NK cells to poly I:C stimulation in mice. Poly I:C inoculation inhibited B16-F1 tumor growth in a manner dependent on the presence of IPS-1 and TRIF. Poly I:C indirectly activated NK cells via DCs, and CD8α+, but not CD8α−, cDCs are responsible for the activation of NK cells. Interestingly, both the MDA5-IPS-1-dependent and the TLR3-TRIF-dependent pathways operated in CD8α+, but not CD8α−, cDCs to express genes encoding type I IFNs and IL-12p40. We have previously shown that production of type I IFNs and IL-12p40 to poly I:C stimulation was differentially regulated by the IPS-1 and TRIF-dependent pathways, respectively. The importance of type I IFNs and proinflammatory cytokines for the activation of NK cells is widely accepted (1, 37). Type I IFN receptor-deficient mice show severe defects in the activation of NK cells in response to poly I:C inoculation and virus infection (4, 38). Nevertheless, IPS-1−/− mice did not show profound defects in either NK cell cytotoxicity or IFN-γ production in response to poly I:C. Although we do not have a clear explanation for this discrepancy in the role of type I IFNs in NK cell activation, low amounts of type I IFNs produced in a TRIF-dependent manner may be sufficient to potentiate NK cell activation. In contrast, TRIF−/− mice showed partially reduced NK cell cytotoxic activity and normal IFN-γ production in response to poly I:C. We previously showed that IL-12p40 production in response to poly I:C is severely impaired in mice lacking TLR3 or TRIF (11, 27). Nevertheless, poly I:C induced normal type I IFN production in TRIF−/− mice. Therefore, it is possible that type I IFNs may be sufficient for full activation of NK cells in response to poly I:C treatment. B16-F1 melanoma cells are known to be targeted by NK cells because of low expression levels of MHC class I molecules. Depletion of NK cells revealed that B16-F1 cells were eliminated by NK cells in response to poly I:C inoculation. The antitumor effect of poly I:C toward B16 melanoma cells was totally abrogated in IPS-1−/−TRIF−/− mice, whereas deficiency in either IPS-1 or TRIF caused modest defects in the effect of poly I:C. A previous report showed that TRIF was important for the antitumor effect of poly I:C on experimental tumors produced by B16 cells (25). Although we have no clear explanation for this discrepancy, our data clearly demonstrate that IPS-1 and TRIF both contribute to the suppression of B16 tumor growth in response to poly I:C stimulation. Further investigations of the mechanisms of NK cell activation via innate stimuli will lead to the development of efficient immunotherapies for infectious diseases and cancer. Poly I:C is known to maturate DCs to activate acquired immune responses and antitumor immune response. We have previously shown that enhancement of Ag-specific Ab responses as well as CD8+ T cell expansion to poly I:C stimulation was dependent on the presence of IPS-1 and TRIF. Whereas poly I:C-enhanced Ab responses was mainly dependent on IPS-1, activation of cytotoxic T cell responses was abolished only when both IPS-1 and TRIF were absent. Together with the requirement of IPS-1 and TRIF in poly I:C-induced activation of NK cells, MDA5 and TLR3 are responsible for most biological responses to poly I:C.
NK cells were not directly activated in response to poly I:C, and coculture of NK cells with DCs induced IFN-γ production in vitro in mice. NK cells did not express TLR3 in mice, although it was reported that TLR3 was expressed in human NK cells. Thus, it is possible that direct recognition of poly I:C by NK cells contributes to NK cell activation in humans. However, it was also reported that IFN-γ production from human NK cells was elicited only when the cells were costimulated with IL-12 or IFNα, indicating that support from innate immune cells are also critical for human NK cell activation. In contrast, MDA5 was expressed in mouse NK cells. It remains to be clarified the reason why MDA5 do not recognize poly I:C in mouse NK cells, but RNA virus infection in NK cells may induce MDA5-dependent type I IFN responses directly in NK cells. By using Ifnα6gfp mice, we found that CD8α+ cDCs, but not CD8α− cDCs or pDCs, produced IFNα in response to poly I:C stimulation in vivo. Furthermore, induction of the genes encoding IFNβ, IL-12p40, and IL-6 was also limited to CD8α+ DCs. It has been reported that TLR3 is expressed in CD8α+ DCs, but not in CD8α− DCs or pDCs (39). These results clearly demonstrate that the MDA5-IPS-1- and TLR3-TRIF-dependent pathways operate in CD8α+ DCs, but not in other DC subtypes. TLR3 is expressed on CD8α+, but not CD8α− or plasmacytoid, DCs, suggesting that CD8α+ DCs are potent in producing IL-12p40 because of high TLR3 expression. In contrast, the expression of MDA5 is ubiquitously expressed in CD8α+ and CD8α− cDCs as well as pDCs. 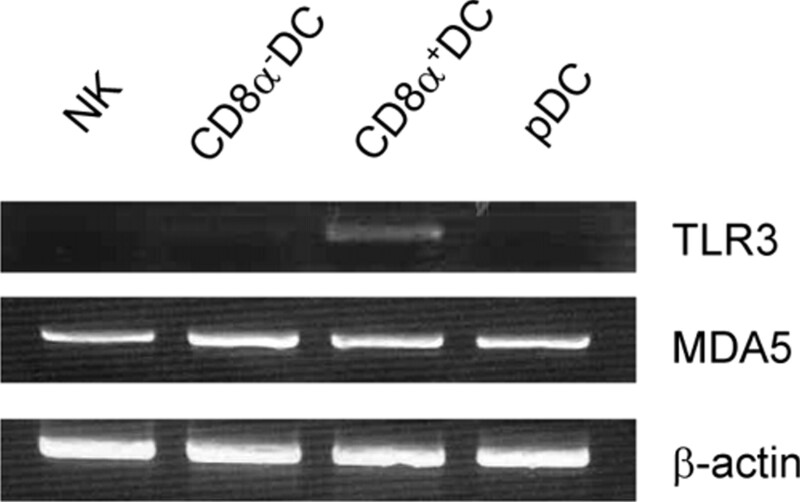 Nevertheless, only CD8α+ DCs produced type I IFNs to poly I:C inoculation. Considering that MDA5 is a cytoplasmic protein, CD8α+ DCs might be more potent to incorporate extracellular substances to the cytoplasm than other DC cell types. CD8α+ DCs are believed to be critical for cross-priming of viral Ags and inducing cytotoxic T cell activation. It has been shown that CD8α+ DCs ingest virally infected cells and recognize viral dsRNA via TLR3 to promote cross-priming (40). Therefore, it will be interesting to investigate the involvement of the RLR pathways in cross-priming in future studies. We thank all the colleagues in our laboratory, E. Kamada for secretarial assistance, and Y. Fujiwara, M. Kumagai, and R. Abe for technical assistance. We thank Dr. H. Tsutsui for providing the YAC-1 cell line. ↵1 This work was supported by the Special Coordination Funds of the Japanese Ministry of Education, Culture, Sports, Science and Technology, and grants from the Ministry of Health, Labour and Welfare in Japan, the Global Center of Excellence Program of Japan, and the National Institutes of Health (P01 AI070167). H.K. was supported by a postdoctoral fellowship (grant number P08123) from the Japan Society for the Promotion of Science, Japan. ↵3 Abbreviations used in this paper: DC, dendritic cell; RIG-I, retinoic acid-inducible gene-I; RLR, RIG-I-like receptor; MDA5, melanoma differentiation-associated gene 5; CARD, caspase-recruit domain; IPS-1, IFNβ promoter stimulator-1; IKK, IκB kinase; TBK1, TANK-binding kinase 1; TRAF, TNF receptor associated factor; IRF, IFN-regulatory factor; TRIF, Toll/IL-1R domain-containing adaptor inducing IFN; poly I:C, polyinosinic-polycytidylic acid; pDC, plasmacytoid DC; cDC, conventional dendritic cell; qPCR, quantitative real-time PCR. Biron, C. A., K. B. Nguyen, G. C. Pien, L. P. Cousens, T. P. Salazar-Mather. 1999. Natural killer cells in antiviral defense: function and regulation by innate cytokines. Annu. Rev. Immunol. 17: 189-220. Fehniger, T. A., S. F. Cai, X. Cao, A. J. Bredemeyer, R. M. Presti, A. R. French, T. J. Ley. 2007. Acquisition of murine NK cell cytotoxicity requires the translation of a pre-existing pool of granzyme B and perforin mRNAs. Immunity 26: 798-811. Andoniou, C. E., S. L. van Dommelen, V. Voigt, D. M. Andrews, G. Brizard, C. Asselin-Paturel, T. Delale, K. J. Stacey, G. Trinchieri, M. A. Degli-Esposti. 2005. Interaction between conventional dendritic cells and natural killer cells is integral to the activation of effective antiviral immunity. Nat. Immunol. 6: 1011-1019. Medzhitov, R., C. A. Janeway, Jr. 1997. Innate immunity: impact on the adaptive immune response. Curr. Opin. Immunol. 9: 4-9. Strowig, T., F. Brilot, C. Munz. 2008. Noncytotoxic functions of NK cells: direct pathogen restriction and assistance to adaptive immunity. J. Immunol. 180: 7785-7791. Kato, H., O. Takeuchi, S. Sato, M. Yoneyama, M. Yamamoto, K. Matsui, S. Uematsu, A. Jung, T. Kawai, K. J. Ishii, et al 2006. Differential roles of MDA5 and RIG-I helicases in the recognition of RNA viruses. Nature 441: 101-105. McCartney, S. A., M. Colonna. 2009. Viral sensors: diversity in pathogen recognition. Immunol. Rev. 227: 87-94. Takeuchi, O., S. Akira. 2009. Innate immunity to virus infection. Immunol. Rev. 227: 75-86. Yoneyama, M., M. Kikuchi, K. Matsumoto, T. Imaizumi, M. Miyagishi, K. Taira, E. Foy, Y. M. Loo, M. Gale, Jr, S. Akira, et al 2005. Shared and unique functions of the DExD/H-box helicases RIG-I, MDA5, and LGP2 in antiviral innate immunity. J. Immunol. 175: 2851-2858. Hornung, V., J. Ellegast, S. Kim, K. Brzozka, A. Jung, H. Kato, H. Poeck, S. Akira, K. K. Conzelmann, M. Schlee, et al 2006. 5′-Triphosphate RNA is the ligand for RIG-I. Science 314: 994-997. Pichlmair, A., O. Schulz, C. P. Tan, T. I. Naslund, P. Liljestrom, F. Weber, C. Reis e Sousa. 2006. RIG-I-mediated antiviral responses to single-stranded RNA bearing 5′-phosphates. Science 314: 997-1001. Kato, H., O. Takeuchi, E. Mikamo-Satoh, R. Hirai, T. Kawai, K. Matsushita, A. Hiiragi, T. S. Dermody, T. Fujita, S. Akira. 2008. Length-dependent recognition of double-stranded ribonucleic acids by retinoic acid-inducible gene-I and melanoma differentiation-associated gene 5. J. Exp. Med. 205: 1601-1610. Kawai, T., K. Takahashi, S. Sato, C. Coban, H. Kumar, H. Kato, K. J. Ishii, O. Takeuchi, S. Akira. 2005. IPS-1, an adaptor triggering RIG-I- and Mda5-mediated type I interferon induction. Nat. Immunol. 6: 981-988. Meylan, E., J. Curran, K. Hofmann, D. Moradpour, M. Binder, R. Bartenschlager, J. Tschopp. 2005. Cardif is an adaptor protein in the RIG-I antiviral pathway and is targeted by hepatitis C virus. Nature 437: 1167-1172. Xu, L. G., Y. Y. Wang, K. J. Han, L. Y. Li, Z. Zhai, H. B. Shu. 2005. VISA is an adapter protein required for virus-triggered IFN-β signaling. Mol. Cell 19: 727-740. Honda, K., S. Sakaguchi, C. Nakajima, A. Watanabe, H. Yanai, M. Matsumoto, T. Ohteki, T. Kaisho, A. Takaoka, S. Akira, et al 2003. Selective contribution of IFN-α/β signaling to the maturation of dendritic cells induced by double-stranded RNA or viral infection. Proc. Natl. Acad. Sci. USA 100: 10872-10877. Akazawa, T., T. Ebihara, M. Okuno, Y. Okuda, M. Shingai, K. Tsujimura, T. Takahashi, M. Ikawa, M. Okabe, N. Inoue, et al 2007. Antitumor NK activation induced by the Toll-like receptor 3-TICAM-1 (TRIF) pathway in myeloid dendritic cells. Proc. Natl. Acad. Sci. USA 104: 252-257. Trumpfheller, C., M. Caskey, G. Nchinda, M. P. Longhi, O. Mizenina, Y. Huang, S. J. Schlesinger, M. Colonna, R. M. Steinman. 2008. The microbial mimic poly IC induces durable and protective CD4+ T cell immunity together with a dendritic cell targeted vaccine. Proc. Natl. Acad. Sci. USA 105: 2574-2579. Kumar, H., S. Koyama, K. J. Ishii, T. Kawai, S. Akira. 2008. Cutting edge: cooperation of IPS-1- and TRIF-dependent pathways in poly IC-enhanced antibody production and cytotoxic T cell responses. J. Immunol. 180: 683-687. Kumar, H., T. Kawai, H. Kato, S. Sato, K. Takahashi, C. Coban, M. Yamamoto, S. Uematsu, K. J. Ishii, O. Takeuchi, S. Akira. 2006. Essential role of IPS-1 in innate immune responses against RNA viruses. J. Exp. Med. 203: 1795-1803. Jang, M. H., N. Sougawa, T. Tanaka, T. Hirata, T. Hiroi, K. Tohya, Z. Guo, E. Umemoto, Y. Ebisuno, B. G. Yang, et al 2006. CCR7 is critically important for migration of dendritic cells in intestinal lamina propria to mesenteric lymph nodes. J. Immunol. 176: 803-810. Karre, K., H. G. Ljunggren, G. Piontek, R. Kiessling. 1986. Selective rejection of H-2-deficient lymphoma variants suggests alternative immune defense strategy. Nature 319: 675-678. Lanier, L. L.. 1998. Follow the leader: NK cell receptors for classical and nonclassical MHC class I. Cell 92: 705-707. Schmidt, K. N., B. Leung, M. Kwong, K. A. Zarember, S. Satyal, T. A. Navas, F. Wang, P. J. Godowski. 2004. APC-independent activation of NK cells by the Toll-like receptor 3 agonist double-stranded RNA. J. Immunol. 172: 138-143. Pisegna, S., G. Pirozzi, M. Piccoli, L. Frati, A. Santoni, G. Palmieri. 2004. p38 MAPK activation controls the TLR3-mediated up-regulation of cytotoxicity and cytokine production in human NK cells. Blood 104: 4157-4164. Swann, J. B., Y. Hayakawa, N. Zerafa, K. C. Sheehan, B. Scott, R. D. Schreiber, P. Hertzog, M. J. Smyth. 2007. Type I IFN contributes to NK cell homeostasis, activation, and antitumor function. J. Immunol. 178: 7540-7549. Martinez, J., X. Huang, Y. Yang. 2008. Direct action of type I IFN on NK cells is required for their activation in response to vaccinia viral infection in vivo. J. Immunol. 180: 1592-1597. Schulz, O., S. S. Diebold, M. Chen, T. I. Naslund, M. A. Nolte, L. Alexopoulou, Y. T. Azuma, R. A. Flavell, P. Liljestrom, C. Reis e Sousa. 2005. Toll-like receptor 3 promotes cross-priming to virus-infected cells. Nature 433: 887-892.